All of New Zealand is at risk of earthquakes. Learn what to do before, during and after an earthquake to help you and your family. Earthquakes can cause damage to buildings and roads. Knowing what to do immediately following an earthquake can prevent injury and save lives. Every household should create and practice a Household Emergency Plan. It's also important to have emergency survival items and a getaway kit. As well as this, every household should plan and practice what to do in the event of an earthquake. Pick safe places in each room. Practice drop, cover and hold. Make sure your home and critical buildings are securely anchored to their foundations. Secure heavy objects both inside and outside the home. If you are outside, find a clear spot and drop to the ground. If you are inside when the shaking starts, move no more than a few steps to a safe place and drop, cover and hold. It makes you a smaller target, stops you being knocked over and protects your head, neck and vital organs. Check yourself and then others. If you are near the coast, in an earthquake that rolls for more than a minute OR makes it hard to stand up, don’t wait for an official tsunami warning. Move to high ground or as far inland as you can. Walk if you can. Stay there until you get the all clear. Instruments record the ground shaking from over 14,000 earthquakes in and around the country each year. Most are too small to be noticed, but between 150 and 200 are big enough to be felt. Ground shaking from earthquakes can cause buildings and bridges to collapse; disrupt gas, electricity, and telephone services; and sometimes trigger landslides, avalanches, flash floods, fires, and tsunami. Buildings with foundations resting on unconsolidated landfill or other unstable soils are at increased risk of damage, as are homes not attached to their foundations. In general, damage to buildings is the main cause of financial loss from earthquakes. Collapse of buildings is the main cause of casualties, either through crushing or entrapment. Loss of services is the main cause of people becoming displaced. Learn if earthquakes are a risk in your area by contacting your local council. Information about earthquake risk is also available on the GNS Science website. 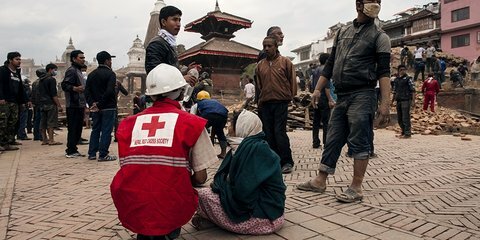 As search and rescue efforts continue, hospitals in the capital continue to function but are stretched to the limit. Powerful aftershocks continue to be felt, so further damage is a risk, increasing the climate of fear amongst the local population. Mike Carson spent the morning of 25 June 2015 as part of a New Zealand Red Cross team making sure Whanganui people whose houses were flooded had somewhere to stay. 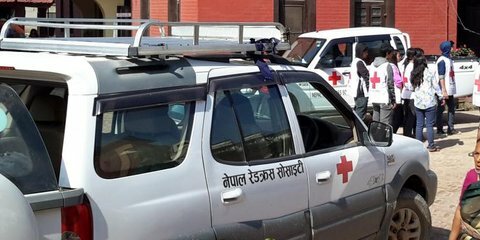 Then the Whanganui man flew to Nepal to join the Red Cross team helping after two major earthquakes.